It’s not fall yet, thank goodness. I’m not ready to give that up yet – despite the fact that I’m wearing jeans more often than bare legs and I’ve got my umbrella at the ready. It’s that weird between-seasons time and it makes me a little restless since I no longer have school days to help ground me. It’s weird how I haven’t been in school for years, but the beginning of September feels so much like school. That feeling just sticks, I guess. Produce at the markets begin to change too. 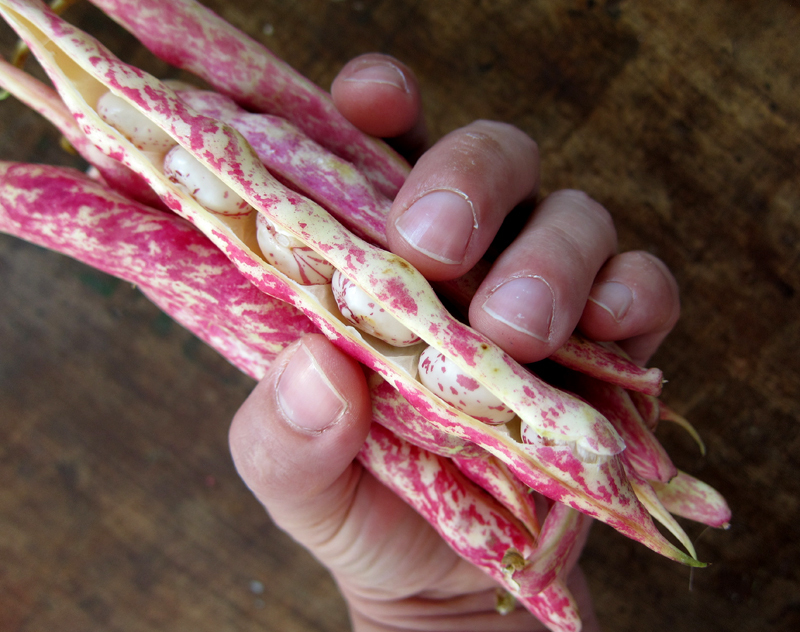 In mid August, these cranberry beans (aka borlotti beans) started appearing and should stick around for at least a few more weeks, I hope. They’re gorgeous, aren’t they? Their pods are stunning and I didn’t expect the beans themselves to be just as pretty. But they are. This was my first time buying them fresh and I wasn’t sure what to do with them. Braising seemed like the simplest option, especially since I had some bacon and fresh herbs on hand to help with flavour. 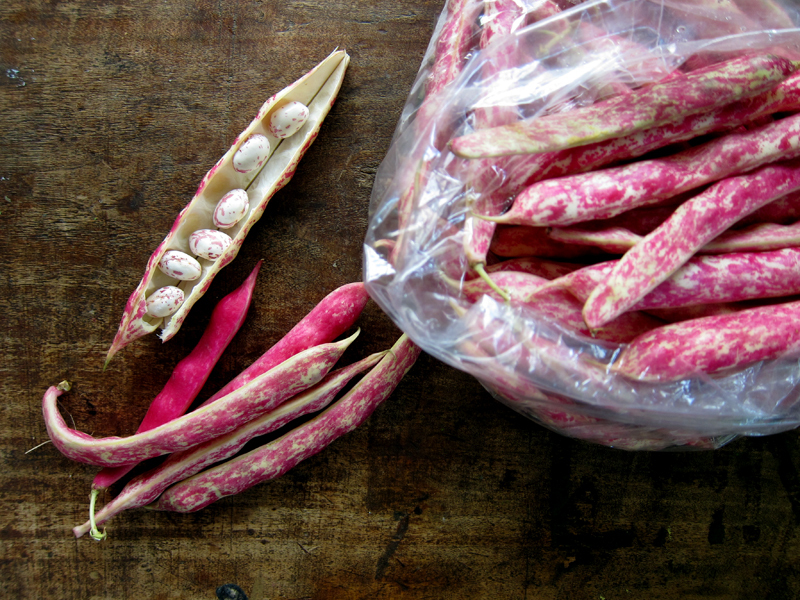 It was a good move – just don’t expect those pretty beans to keep their bright pink speckles once cooked. Okay, they’re no longer gorgeous, but what they lack in the looks department they make up for in taste and texture. They reminded me of a dish of stewed beans that I used to order at a Greek restaurant in my hometown. I’d eat the beans with buttered bread and a glass of wine and be totally sated. This bean dish was similar – the beans were creamy and slightly nutty and what I would have given to have bread to sop up all the juices! 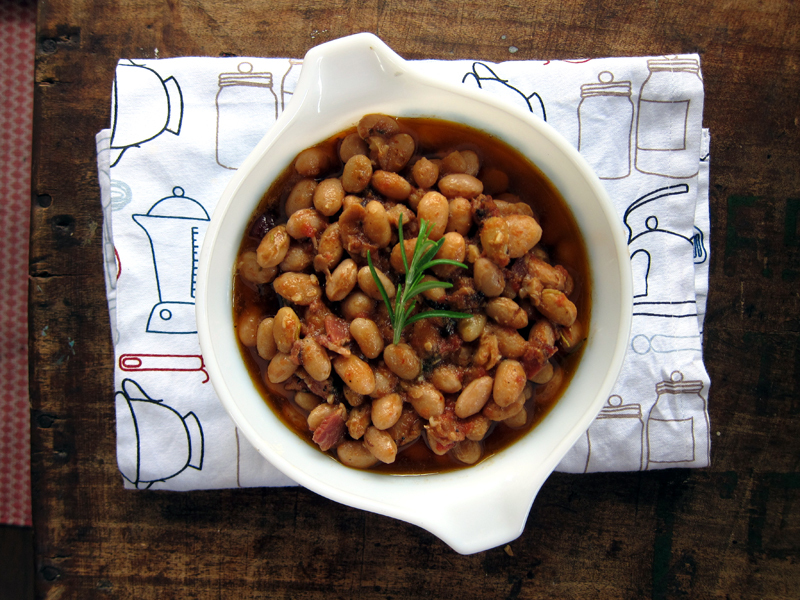 The beans are smokey from the bacon and the fresh herbs – the rosemary especially – makes a serious impact. A tip for next time: have bread handy! And greens to go alongside! Though, beer and a sausage in a pinch works too. The bacon/pancetta and the tomato are both optional here. Though I think a tablespoon of tomato paste or even ketchup would add a good bit of tomato flavour. Some recipes state that fresh cranberry beans are ready in 20 minutes – mine took upwards of 45 minutes – so check in at the 20 minute mark, as you don’t want mushy beans. 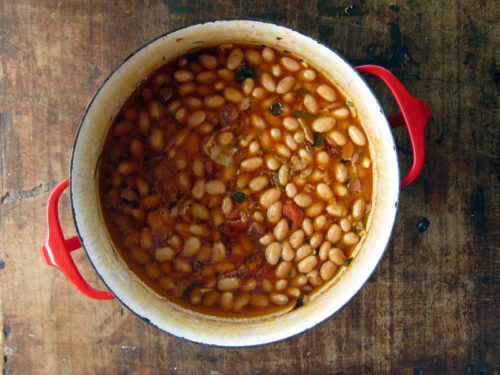 Shell your beans and set aside. In a heavy pot, add in 2 tablespoons of olive oil and saute the bacon med-high heat until the bacon gets crisp. Add in the onion and saute for 5 minutes until wilted. Stir in the garlic along with the tomato, fresh herbs, and aleppo pepper. Add beans. Pour in additional olive oil if necessary to give the beans a good coating. Pour in water and chicken stock. Cover and bring to a boil for 5 minutes. 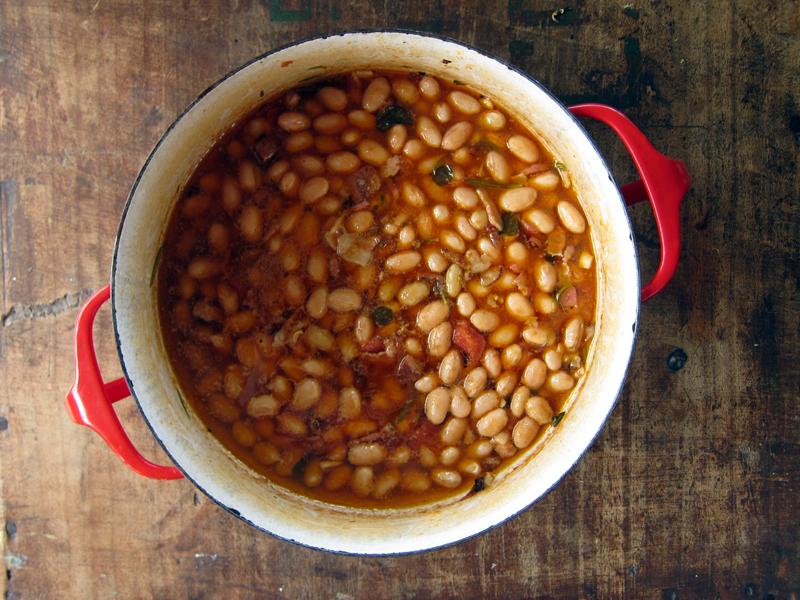 Reduce heat and simmer for 30 minutes to 45 or until beans are tender (not mushy) and most of the liquid has reduced. If I find the liquid is still plentiful, remove the lid and turn up the heat to a boil to help evaporate the excess. Taste and add in salt or pepper, if needed. Drizzle with a good, fruity olive oil if you want to up the richness. Serves 4. Sorry, I’m sure this is obvious to better cooks, but when do you add the beans? After onions? Before or after additional olive oil? Marie, Jeez, my appologies! I was too quick on the draw. Add beans just after the garlic. Enjoy! It’s so great for this weather. Yes, Sheena, it’s perfect for today. Enjoy! Just this am out checking my borlottis in the garden and they are not ready yet.!!!! this is the first time that I have grown them. Have soybeans in too but they did not sprout well at all and the above overwhelmed them. Looking forward to fresh soybeans, when I can find them!! Last year did Jacob’s Cattle and black beans and they were ready before the frost. I will definitely try this recipe. I know just what you mean about this time of year. September always gives me that back to school feeling and this isn’t helped by the fact my husband is a teacher! I’ve never seen cranberry beans before. They are so pretty and even when cooked they look delicious. The perfect meal to help you transition between the seasons. I’m definitely going to have to see if we have borlotti beans are our markets here!! They are too pretty to pass up. ANd I know that Greek dish you’re talking about..and now that is exactly what I’m craving. 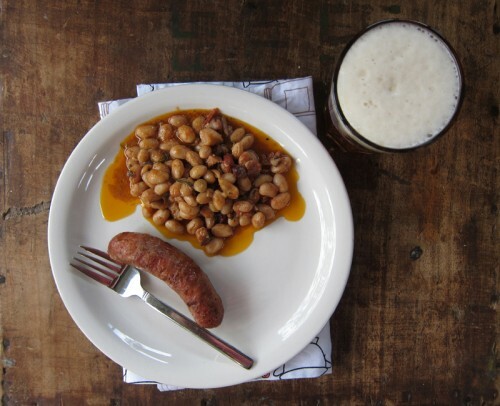 Beans, beer, and sausage. Sounds like the recipe for a cozy fall evening! I just have to make this…heading to the farmer’s market for fresh beans! 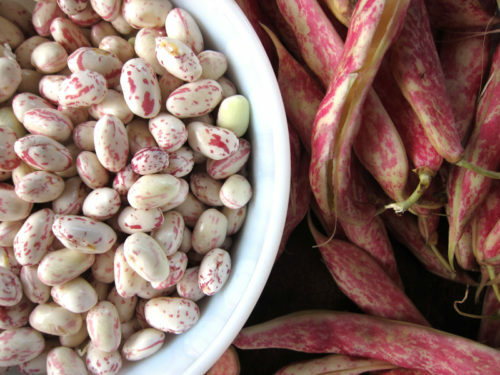 I went on a Paleo diet in Spring and beans were forbidden (I know, I know…crazy right). I’m no longer on the diet, for many obvious reasons (um, cholesterol) and since then I’ve jumped face first into eating beans and legumes again. Oh hummus, I’ve missed you. 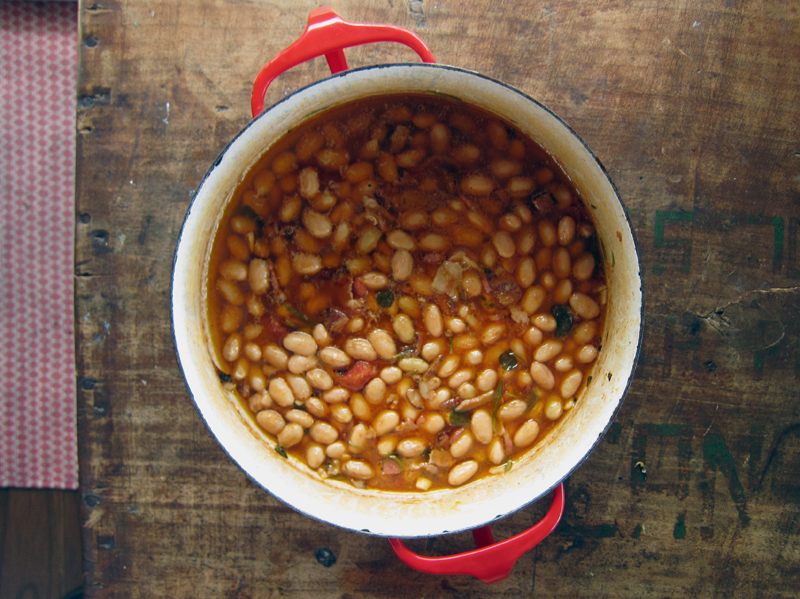 My mom used to grow barlotti beans in our backyard for the purpose of making Greek bean stew called ‘fasolada.’ It’s a hearty winter bean stew that costs pennies to make and is very filling and good for you. It is eaten with crusty bread for dunking and a plate of olives and feta. I love adding bacon or pancetta to stews. It’s subtle smokiness adds a depth of flavour that is so delicious! Im going to eat that! Great looking beans…raw and cooked. Thanks for the recipe…I should be eating more beans. Caz, seek them out, they’re terrific! And gorgeous too. Joanne, yes, that bean dish is a good one, but this one comes very close. Hooray for eating beans again, Joanne! Aw, that’s what that stew was called! It’s a good one. 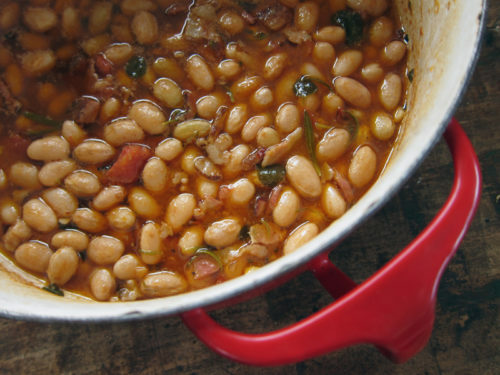 I’ll have to seek out a traditional recipe and try it out this winter with some dried beans. Eileen, I hope you found what you were looking for at the market! This is a keeper of a recipe & I hope you try it out.